I have meant to write a little post about the amazing place we stayed in to celebrate my brother-in-law's 40th birthday recently. Not purely just to brag but because I genuinely think it's a real find and somewhere that anyone would love - whether you've got kiddies or not. (Though it is brilliant for kids). After somewhere to relax? Love a landscaped garden? Swimming pool a must? Fancy a tennis court five minutes from your door? And the kind of decor you'd get in a boutique hotel? This place ticks all of those boxes. And then some. The Emerald is a glorious retreat tucked away in the Cornish countryside which houses five properties, all completely different, all completely beautiful, dotted around five acres of gardens. You can rent each one out separately but there were 22 of us (including 10 children), so we had the whole place to ourselves (whoop!) and each family or couple had their own unique private space. We stayed in The Gatehouse, which sleeps four to six and is a little bit more rustic than the others (think very fancy farmhouse) but still comes with the same mod cons - smart televisions, coffee machines, underfloor heating. If you're after something a bit bigger, there's also Drift and Coast, which each sleep six and come complete with glass fronted balconies, outdoor hot tubs and even little 'snugs' where the kids loved sneaking off to watch television. 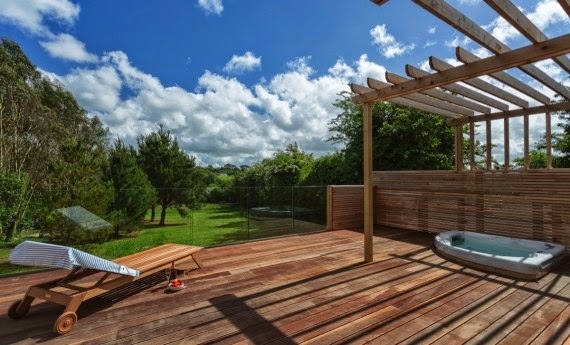 And for two, Fern or Cedar come with private decked terraces and hot tubs. Cosy. Aside from the amazing accommodation, what The Emerald really has going for it is that there is so much to do. It's the best place for kids. We all know the great British summer can be, well, not so great but you'd seriously have no qualms about booking this place because there's the indoor swimming pool (open all hours and mood lit if you fancy a bit of night swimming), the gym and smart TV's or, when it brightens up a bit, there's the tennis courts, table tennis and play area. And the kids loved the gardens; the winding pathways, huge trees and little lake provided the best hideouts for playing (and an Easter egg hunt). If you do ever want to leave, of course there's also the Cornish coast to explore. We loved taking a trip on the King Harry Ferry in Trelissick, lunch at The Pandora Inn in the stunning surroundings of Restronguet Creek and dinner at Rick Stein's in Falmouth. I'd never really explored Cornwall before but in all honesty, I think all of us were a little bit amazed at just how beautiful it is. So really, this is just my very own shout out to The Emerald to say just how great it was and how everyone should just go. The warm and ever-obliging owners, Tim and Brigitte have created an amazing place, that's not only beautiful but zero carbon too - it's the UK's first ever zero carbon holiday accommodation - and I can't imagine the amount of work that must have gone into it but there's a lot of love in it too. And it really shows. My advice? Book it soon because this place is going to be busy. (Find out more about The Emerald here www.emeraldcornwall.co.uk).